Apis Hotel is located in close proximity to Cracow’s Old Town and Central Railway Station (2 km). When you are in a hurry to reach other destinations, whether by train, car or by plane, our location gives you the edge, and multiple travel options. Our CCTV-monitored parking area is free for guests. When in need of immediate information access, you can easily explore the Internet from our lobby desktop. The city’s main tourist attractions and business centres are only a few minutes away. We are a proven and reliable partner for both business clients and tourists. Hotel has 42 spacious apartments, including both “comfort” and “superior” types. Each and every room of ours represents natural balance between modern design and elegance in the choice of colour and style. For our guests: modern bathrooms, heating/air-conditioning, TV Sat, telephone, Wi-Fi access free-of-charge. Additionally, in the superior category, jacuzzi. Our Wellness Centre, with sauna, steam room and gym will help you relax in the evening or better start a busy day. Our fully-equipped conference facilities can host up to 50 guests.. 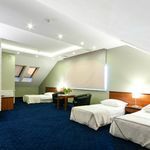 The rating of Hotel Apis Kraków is 8.6 from the maximum 10, 4 based on actual and valid guest ratings and reviews. "Pokój 406 który dostałam poza standardem - stary, obdrapany, wystrój niepasujący do 4 gwiazdek jak z innej epoki, złe działająca klimatyzacja, brzydko pachnące ręczniki, za mały jak dla 2 osób (skosy), niezgodny ze zdjęciem w internecie"
"Távozáskor a recepciós flegmán viselkedett (csapkodott) és látszott rajta, hogy a számlázást illetően nem áll a helyzet magaslatán." "Kiváló volt a szálloda étterme és a személyzet döntő többsége barátságos volt."